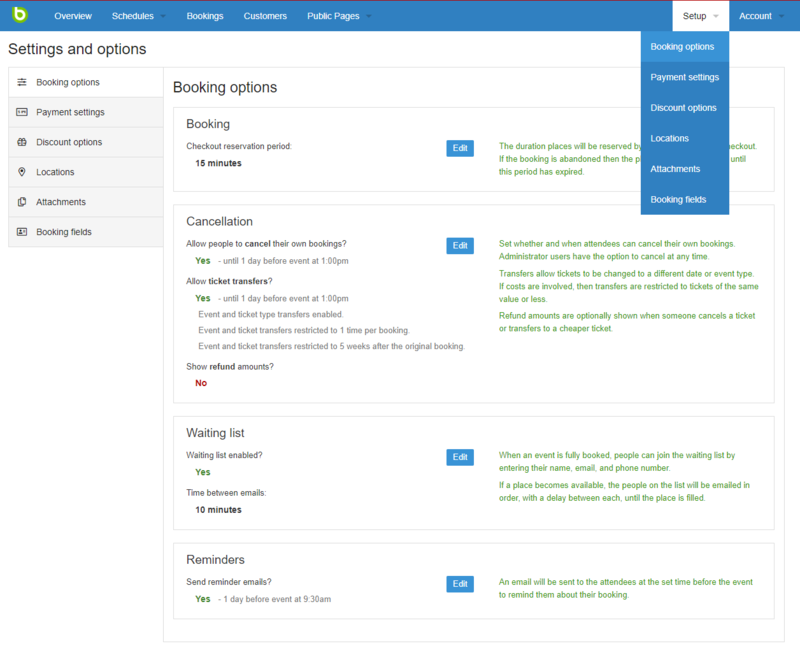 You can find Booking options after clicking on the setup drop-down menu from the top of the admin site. Here you can determine the conditions surrounding your customer’s bookings and cancellations. Checkout reservation period - This is how long your customer’s place will be reserved after they begin checkout. For instance, if you set this option to '15 minutes' your customer will have 15 minutes to complete checkout before their place is available to others again. Learn more about how customers book through Bookwhen in our support article. Allow people to cancel their own bookings? - As an administrator you can cancel your customer’s booking at any time, this option allows customers to do this for themselves. Allow ticket transfers? - As an administrator you can transfer your customer’s tickets to any other ticket of equivalent (or less) value at any time, this option allows your customers to do this themselves. Ticket transfers are only available on Lite (and above) plans. More information on transfer restrictions here. Show refund amounts? - This shows your customer the amount that they are due if they cancel a ticket, or transfer to a ticket of lower value - refunds must be completed via your payment gateway. Waiting list enabled? - When enabled this option allows your customers to enter contact information so that they can be notified if a place becomes available. Waiting list is only available on Standard (and above) plans. Send reminder emails? - By enabling this option you will ensure that attendees receive a reminder email in advance of your event, you can also specify how far in advance this message will arrive.